ManGrate is proud to announce a partnership with an established and impressive American company, Acala Farms. 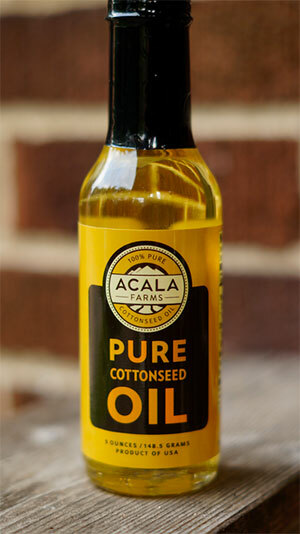 After careful research as to the best type of oil for seasoning ManGrate’s cast iron grates, Acala Farms’ cottonseed oil became the clear choice as our “official” seasoning oil. And just this week a special griller’s bundle was added to ManGrate’s product line, which includes Acala Farms’ oil and a discounted price point—perfect for gift giving! Find it here. What makes cottonseed oil superior to other types of oils (like vegetable, canola or olive) for seasoning the grates? The oil has a high smoke point, tolerant of temperatures of 425 or more degrees—ideal for permeating and filling the pores of the iron, creating a virtually non-stick surface and added durability without burning, scorching or odd flavor. We were also impressed with the health benefits and science behind cottonseed oil—zero trans fat, zero cholesterol and Acala Farms assures pesticide-free farming methods, so the oils are pure with a natural long shelf life. Acala Farms brands itself as the “new generation of cottonseed oils.” Historically cottonseed oil has been in our kitchens for a century—even as the vegetable shortening CRISCO®—and the oil has been used in commercial kitchens and bakeries all over the country. Cottonseed oil has also traditionally been used in the south, and I assume due to its high flash point, is favored for frying. Acala Farms not only offers plain oil to consumers, but they are the first to bring flavor-infused cottonseed oil directly to consumers. I have used three of the flavored oils, incidentally: The Fresh Roasted Garlic is fantastic to sauté chicken as well as mushrooms and onions; the Fresh Cilantro made a fantastic salad dressing whisked with white balsamic vinegar and ground black pepper; the Jalapeño Lime was good drizzled on toasted baguette slices with sliced tomato and crumbled Queso blanco (soft cheese). Sarah Botham is the president and founder of Acala Farms. She is also the owner/founder of Botham, ink. (an established marketing and public relations firm), is a faculty associate at University of Wisconsin-Madison, and is the VP and director of marketing at Botham Vineyards & Winery. Extremely accomplished professional, right? But as I’ve been working with her I’ve also come to not only respect her, but I really like her. Botham agreed to share some information on the Acala Farms story and cottonseed oil itself with me. Grate Bites: You and your husband, Peter, run Botham Vineyards & Winery, just west of Madison, WI. How did it come about to produce cottonseed oil (particularly in the north, which I would have thought wasn’t an ideal climate for growing cotton)? Sarah Botham: My husband founded Botham Vineyards before we were married. I became involved in 1991 after Peter hired my firm to develop the brand identity, packaging and marketing strategies for the vineyard. We were married in 1995. Cotton Incorporated (recognized by the ‘The Fabric of Our Lives’ tagline) has been a client of my marketing and PR firm, Botham, ink., for about 10 years. My work with Cotton Incorporated, however, centers on the agricultural side of things, most specifically working with the Agricultural Marketing Research division whose charge it is to find new uses for all parts of the cotton plant and develop new products and markets for it. As a non-profit organization that is funded by the cotton growers, however, Cotton Incorporated cannot earn commercial revenue, so when a new product is far enough along in the development process to be ready for commercial release, it needs to find commercial partners. In about 2010 or 2011 though, we started focusing on ‘Cotton as a Food Crop’ and identified cottonseed oil as the first and best place to start. Since it was already a commercial product widely used and distributed in restaurants and in food production, we looked for new ways to introduce it to a more mainstream market. Thus, the flavor-infusion idea was born. Access to a new generation of cottonseed oil that is free of trans fats, cholesterol and is certified pesticide-free made the product all that much more appealing. Once the infusions were perfected, so to speak, it was time again for Cotton Incorporated to seek out a commercial partner. Since my husband, Peter, and I already had bottling, branding, distribution and beverage marketing experience via the wine business (as had several of my other clients), it seemed a natural leap to get on board and say yes to the opportunity. We launched Acala Farms in January 2012 and started selling product in August of the same year. GB: So you were tapped for the marketing and distribution experience, not for the expertise in growing grapes? SB: The seed for our oils comes from cotton grown in Texas and Louisiana. Wisconsin is definitely too cold for growing cotton. We worked with a food lab to develop the flavor infusions for the oils and then chose a co-packer located in Tennessee to bottle the product for us. Oil is a substance that requires skill and care to infuse and bottle; the conditions must be just right during the bottling process. That’s the reason we work with a co-packer—some things are just best left to the pros. The infusion process actually happens just as the product is bottled, so it’s a pretty efficient process. GB: Can you explain a little bit about the agricultural and processing methods (including being pesticide-free)? SB: Cotton grown in the U.S. today is actually subject to less pesticide than either corn or soybeans—not many people know or understand that. Cotton also uses very little water and can survive in near-drought conditions. It is a miraculous little plant that provides fiber, food and inputs for a long list of other products. Every part of the cotton plant has a purpose and new uses for it are identified and brought to market nearly every year. Our cottonseed oil is certified pesticide-free (any residues are removed in the pressing and refining process), an important part of what makes it such an incredible product from every perspective: flavor, performance, and health. GB: ManGrate is excited to share Acala Farms cottonseed oil with our customers and feel confident in recommending it as the official seasoning oil for our grates. Can you share your thoughts on why you think the science behind cottonseed oil is beneficial over other types of oils (ex: Canola, olive, vegetable)? SB: I can’t point to specific science to back cottonseed oil’s extraordinary culinary performance, but I do know that its high smoke point (425+ F) and light body are a powerful combination in any high-heat setting. Unlike so many other oils, cottonseed oil doesn’t break down (other oils actually become rancid) in high heat conditions and the Acala Farms flavor-infused oils also retain their intense flavor under these same conditions. GB: There are health benefits of the oil, and despite being unhydrogenated—unlike some oils and packaged foods—it has a long shelf life…naturally. SB: From a health perspective, hydrogenation is the downfall of any oil, cottonseed oil included. Hydrogenation adds trans fats and cholesterol, and while it may have a place in the baking world, it isn’t the best choice for much of anything else. Acala Farms oils are not hydrogenated and are thus free of trans fat and cholesterol and the incredibly light body means it is easy to add rich flavor to favorite recipes without adding a heavy, oily or greasy texture. GB: Besides CRISCO (which I personally don’t use often…I am not a baker nor do I fry much), I was not really aware of cottonseed oil. From what I’ve read, a lot of commercial kitchens and chefs use it. Can you expand on that? SB: While CRISCO was originally made using cottonseed oil (CRISCO is actually an acronym for Crystallized Cottonseed Oil), it hasn’t been made from cottonseed oil since the second World War, when the demand for cotton in the war effort drove up the price and the producers opted for another input. I believe it is currently a soybean oil product. But, professional chefs have long understood cottonseed oil’s powerful culinary performance and the many benefits of its use. In its pure form, cottonseed oil is flavor-neutral and virtually tasteless. It also generates no flavor transfer, which is an important characteristic for deep frying—fish and potatoes, for example, could be deep fried in that order and the potatoes won’t come out tasting like fish. Really. Additionally its flavor-neutral characteristic makes cottonseed oil the perfect base for flavor infusion because the infused flavor doesn’t have to compete with the flavor of the oil (think garlic flavored olive oil, for example, which tastes like garlic, but also presents an olive flavor halo). The Acala Farms Flavor-infused Oils present intense flavor, clean and simple, with no oil-flavor halo. Finally, professional chefs understand cottonseed oil’s high-heat capabilities and rely on it for no-fail searing, stir-frying, sautéing and frying. GB: Is Acala Farms one of the only distributors of cottonseed oil to households/consumers? 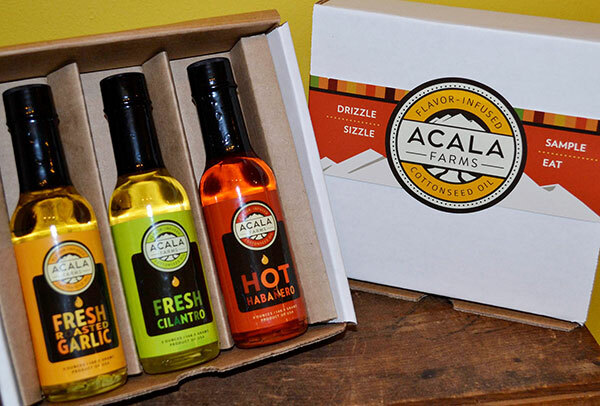 SB: Acala Farms is the only U.S. producer of flavor-infused cottonseed oils. We sell direct to consumers via our website and through select retail outlets throughout the country. GB: Have some favorite recipes you’d like to share? Blend all ingredients in a food processor for two minutes or until it reaches a thick and creamy consistency. Garnish with roasted red peppers or sliced avocado and serve with fresh veggies, crispy crackers or breadsticks for dipping. * Fresh Roasted Garlic, Smoky Chipotle, Jalapeno-Lime, Toasted Cumin or any of the Acala Farms Flavor-infused oils may be used. In a large bowl, combine syrup, lemon juice, Acala Farms Chili Cumin Cottonseed Oil, salt and pepper. Toss sweet potatoes in mixture, coating thoroughly. Arrange potatoes and remainder of sauce in a 13×9 baking pan. Cover and place in over. Check potatoes every 15 minutes and toss until tender, about 45 minutes to one hour. Using a mallet, rolling pin or mortar and pestle, crush the black pepper and combine with salt. Coat the filets with the mixture. Place a large cast iron or heavy-duty skillet over high heat until a drop of water sizzles on it. Add half of the Acala Farms Fried Shallot Cottonseed Oil, allow it to get very hot and add the steaks. Cook over a high flame for 2 1/2 to 3 minutes for rare, 3 minutes for medium rare. Flip the steaks, drizzle remaining Fried Shallot oil over them and cook for another 2 1/2 to 3 minutes for rare or 3 minutes for medium rare. They should be nicely seared on both sides. When the second side is finished, leave the steaks in the pan over high heat, pour the cognac over them and simmer on high for one minute. Remove the steaks to a heated serving platter, scatter raw shallots and crumbled bleu cheese on top and pour remaining liquid from the pan over all. Adapted from a recipe by Katherine Kinsolving and Leslie Brenner, Essential Flavors.